Let me set the stage: in the rural southern area where I live a family income of $90,000 per annum puts you in the top 1%; that may provide a hint about the living standards of families at the lower end of the scale. This spring when the painter we call Gollum showed up to paint the two story building on my place he had with him a young local to assist. The assistant was about six foot three and may have weighed as much as a hound dog. When he climbed the ladder both he and ladder shook like they had Saint Vitus Dance. I had to hold the ladder to prevent both from falling to the ground.. Needless to say, I was relieved when they finished the job and moved on. Later I asked around and heard that the shaker was a meth user; I already knew Gollum was an alcoholic. A few weeks ago I drove by a neighbor's home, just to the west of my place, and saw a young man jumping up and down on a car parked in the front yard. I drove on to town and when I returned later in the morning, the neighbor's yard was filled with police cars. Later I was told the neighbor was threatening to shoot the guy on the car and the police were summonsed. This morning I was told that another neighbor who lives north of me had gone to check on his cows on a very remote location when he spotted a coyote in the pasture. Like most ranchers, he kept a rifle in his truck for just such occasions. After shooting the thing he drove closer to make sure of a clean kill and, much to his amazement, found a naked man tangled up in a barb wire fence. The coyote was waiting for supper to be ready. The guy was incoherent and one of his legs had turned dark blue. Help was called in and the guy, but not the coyote, survived. Twenty years ago some members of the Black community around here took crack, then the younger generation saw what happened to them and they stay clear of the stuff, but the White rural working class is not getting the same message about meth. My completely unscientific observation about rural areas such as this is that the Black working class is headed upwards, while their White counterparts are moving in the other direction. This morning I read in the WaPo that the Oval Office has changed the trajectory of Secretary of Agriculture Vilsack's mission. 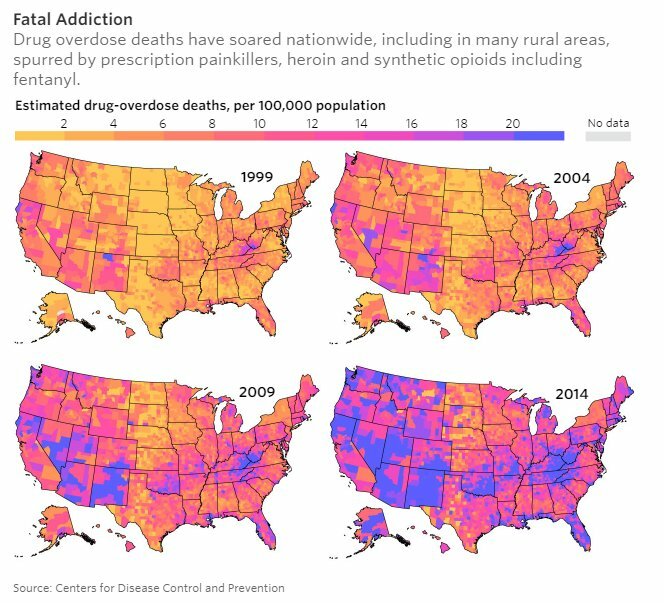 Obama has asked him to oversee the administration’s response to the opioid crisis that is ravaging rural America and to the feelings of economic hopelessness that has taken root. Soon there will be an army of Ag bureaucrats gathering data about cases of overdose recorded in ERs and the number of naked men found entangled in barb wire fence around the country. That should soon resolve the problem and the department can return to the larger problem of cow flatulence ruining the environment. September 30, 2017. Driving on rural highways in Hempstead and Howard county has always been dangerous because of log trucks moving to and from the paper mill in Ashdown. Now a new threat has emerged: pick-em-up trucks driving over the center line. I am starting to encounter one each time I drive to either Hope or Nashville. Three weeks ago on a curve one almost sent me into the ditch. The same ditch in front of my home where a drug runner drove off the road in a stolen car (and stolen plates) three weeks ago. The driver and his package were rescued by an associate long before the police arrived. At first I thought the drivers, all ways white males, were on the 'phone, but I now suspect drugs to be the cause. Later that week, I saw a state policeman and asked him about the erratic drivers and he blamed texting and telephones.